I've eaten at Greens at all times of the day over the last year and have been nothing but impressed with the quality of the food. It's a small bar in Winchester town centre with real character and genuinely friendly service. I live in the town and it's the place I visit more than any other for good food in the �10-15 price range. Yes it's lager only so if it's beer you're after, give the Black Boy or Wykeham Arms pubs a go. 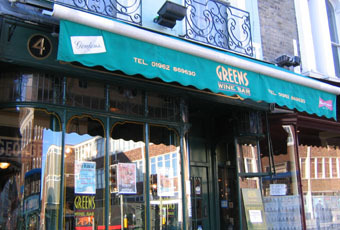 If you're still in town next day with a hangover though, Greens is a great place for breakfast. Great atmosphere on a friday and saturday night, and love the music. I love this venue, it is something different from the main stream wetherspoony type pubs you find in every town. The bar staff and quick and friendly and the bouncers are more than knuckle dragging morons. The place is a little small but well presented with what they have. Foods not bad when I ate in there too. If you want food, I would advise avoiding this place. Food is not prepared fresh, but kept hot in a cabinet which is part of the bar. Come on, this is 2009! Fair enough in a Harvester where you know what you are getting, but not in a place that looks like a bistro from the outside. The food is AWFUL. It may be OK for a drink, but they should stick to that.